Last week we shared some truly unique creations by an artist very close to the Syrian refugee crisis. In a similar spirit of artistic expression, our focus this week is on two Artists; Ali Weiwei and Banksy, who have also used their artistic talents as powerful tools in expressing their heartbreak over the ongoing Syrian Refugee crisis. Banksy is an England-based graffiti artist and political activist of unverified identity. Recently, the mysterious artist, who is most well known for his unique graffiti and outdoor art with deep social undertones, has used his latest art to speak out against the treatment of Syrian refugees. Banksy’s art depicts the young girl from Les Miserables in a cloud of tear gas, her eyes swollen and tears running down here face. The image was strategically painted on a wall across the street and directly facing the French Embassy in London. The artist also painted a scannable QR code on the left bottom corner of the artwork. 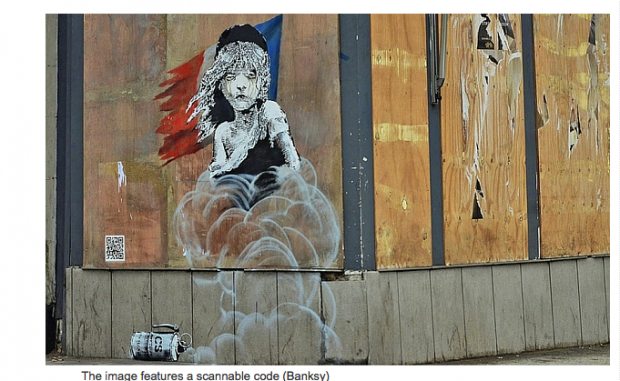 Including a QR codes in his graffiti art is said to be a first for Banksy. Upon scanning the code, it directs viewers to a video on youtube that captures a police raid in the Calias “Jungle” earlier this year. To view more art by Banksy, visit the Artist’s website here. Ai Wei Wei is an artist and Chinese activist who’s art has drawn the attention of people all around the world. 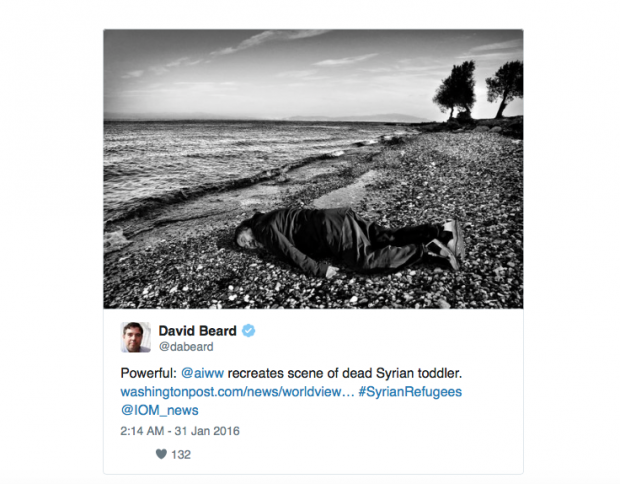 Recently, Ai Wei Wei recreated a horrific scene of a Syrian toddler who died on the beach during the ongoing Syrian Refugee crisis. Ai Wei Wei recreated the scene “to keep the attention on the continued plight of refugees entering Europe”(Think Progress). Ai Wei Wei has a history of using his artistic expressions in art to raise awareness for important issues.